Sisters Natalie and Alice Kessler were close, until adolescence wrenched them apart. 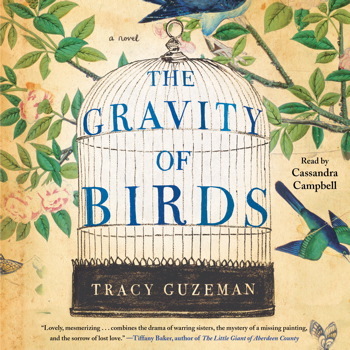 Natalie is headstrong, manipulative—and beautiful; Alice is a dreamer who loves books and birds. During their family’s summer holiday at the lake, Alice falls under the thrall of a struggling young painter, Thomas Bayber, in whom she finds a kindred spirit. Natalie, however, remains strangely unmoved, sitting for a family portrait with surprising indifference. But by the end of the summer, three lives are shattered. Decades later, Bayber, now a reclusive, world-renowned artist, unveils a never-before-seen work, Kessler Sisters—a provocative painting depicting the young Thomas, Natalie, and Alice. Bayber asks Dennis Finch, an art history professor, and Stephen Jameson, an eccentric young art authenticator, to sell the painting for him. That task becomes more complicated when the artist requires that they first locate Natalie and Alice, who seem to have vanished. And Finch finds himself wondering why Thomas is suddenly so intent on resurrecting the past. This isn’t an easy book to describe or review. The story had a slow start and was at times difficult to follow, but in the end it was worth the effort and I’m glad I stuck with it. This is a very literary, complex novel that moves back and forth in time between 1965 and 2007. It is multi-layered, has numerous characters, complicated relationships, and is told from multiple points of view. There’s a lot going on: Love, loss, a decades old mystery, a few unexpected twists plus an interesting look into the world of high-priced art. The book is beautifully written with vivid descriptions, lyrical prose and well-developed characters. It is, at times, a haunting, emotional read. I did enjoy the bird references. In particular, the Blue Grosbeak, a gorgeous bird and not often mentioned in literature. His presence in the artwork is important, which isn’t revealed until the end. This may have been easier to follow in print if it wasn’t for the excellent narration by Cassandra Campbell. Her reading kept me alert to changes in point of view and flashbacks in time. It required a little additional attention but regular audio listeners will be pleased with this production. I have been curious about this one…I’d probably prefer the print version, but that’s because I’m not a fan of audio. Glad you stuck it out and enjoyed it. Thanks for sharing your thoughts. Then definitely go with the print. The audio would be a good choice for those that already do a lot of listening. This does sound like something better suited for print. Thanks for the heads up! I went with audio because I enjoy Cassandra Campbell’s narration. It worked for me because I had a few long stretches of listening. It would be difficult to listen to this in short spurts or in the car. I wasn’t thrilled by this one. I thought it was tough to get into and I wasn’t all that engaged. This book sounds like my cup of tea, Leslie. Thanks for another lovely review.